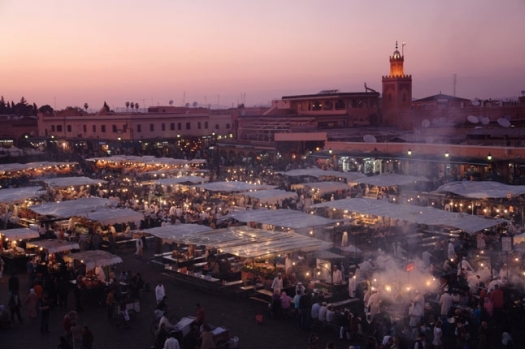 Marrakech is one the more famous Moroccan cities – an exotic and lively hub of cultures that feels as though time itself, is leaving it behind. At the heart of the city is the Djemaa el Fna square, which plays host to a manic swathe of entertainers, locals and tourists alike. Behind the square however, lies the labyrinthine soul of the city – the souks. This maze-like market will leave you dizzy – this is no exaggeration; the heat of the sun will leave you parched and hungry, so it’s best to set out in the early morning or at dusk. Bearing that in mind, once you’ve embarked on your journey, navigated through the seemingly endless train of beggars of the square and stepped into the souks, there is only one direction in which you will want to head – forward. The narrow lanes of the souks are lined with shops whose wares spill out onto the half-cobbled streets. Above is a make-shift wooden canopy that lends itself to the other-worldly, dimly-lit aesthetic of the place – a welcome break from the tiring midday sun and indeed, an intelligent way of luring customers in with shade. The hundreds of specialist shops leave nothing to the imagination, as they stock an almost unimaginably large catalogue of Moroccan ‘specialities’. There are many guides (and opinions), online that all differ, though the general consensus seems to be the same; don’t buy anything unless you have a very good reason for doing so - In times gone by I would imagine that the things on sale were of genuine value and masterfully crafted, however this is no longer the case – everything feels cheap and a true value for money items are few and far between. Many of the items are Chinese imports and sold as ‘authentic’. Buyers beware. Remember, that entering the souks as a tourist, means that the prices of most, if not all items, will magically increase… dramatically. It also, as considered by many of the locals, gives shopkeepers a proverbial ‘license’ to harass you – a common technique used to pressure tourists repeatedly until you give in to parting with your cash (usually more than you’d like to have paid). The bartering itself can have some quite interesting consequences too, for example, if you enter into a negotiation with a seller and don’t agree on a price, you’re likely to receive a murmured ear-bashing in the local tongue! All that said, my words are not to be misunderstood – Marrakech and the souks are not to be missed. A place with such a stark cultural contrast is an experience everyone should have, even if it does push you beyond the limits of your comfort zone. There are tourist police operating in the souks and the locals know this, so a firm but polite ‘no thank you’ or two (or three), should suffice. Getting to Marrakech couldn’t be any easier – non-direct flights from Aberdeen leave frequently and as it’s difficult to park in this area of Aberdeen, parking facilities at the airport are a welcome stress-reducer. Get your bags packed! Travel light and enjoy the sights. Professional Transportation Insurance policy in Florida can be complicated. This article helps visitors to learn simple concepts of what makes up a common commercial truck insurance plan contains.